Liberty States Fiction Writers Conference this weekend! Yes! It’s been a long time since I logged anything here. Why? Well, I’m writing, dammit! I’ll be on deadline well into the summer, creating that magic you must be dying for if you’re reading this. 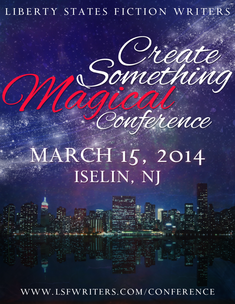 Except for this weekend, where I’ll be at Liberty States Fiction Writers’ annual “Create Something Magical” Conference in Iselin, New Jersey. Hey come on, I have to give this carpel tunnel a break before my hand simply falls off. And because of that, I’ll be engaging in some exercises in alternate rehab therapy. One of my favorite is the One Handed Wine Hoist, a practical ergonomic exercise that offers near immediate relief. Another is the Advanced Beer Lift, preferably performed with a pint of Yuengling. This takes a bit longer to accomplish, as it’s also accompanied by the Chip Dip Scoop and every half-hour or so, the Latrine Trot. Even so, a few hours of this brings on a euphoria that leads one to question whether there ever was any pain at all. But it won’t be all work and therapy. Outside of reader and writers’ tracks, some terrific workshops, panels, editor and agent appointments and Sherrilyn Kenyon as a special there’s a Book Fair that’s open to the public with over thirty authors. To see the full list click here. So if you’ve never been to Iselin, NJ, and are panting to go and meet the great and near-great, swing on by. I’ll show you some great exercise that you’ll feel so much better for.